Jessica and Al were the fighters. The two had been through a lot together. Truly in sickness and in health, the two were ready to tie the knot and spend the rest of their life supporting and loving each other. Jessica was also a big fan of photography. She appreciated creativity and originality. It gave me certain pressure and a lot of fulfillment as a photographer to document their connection and love for each other. 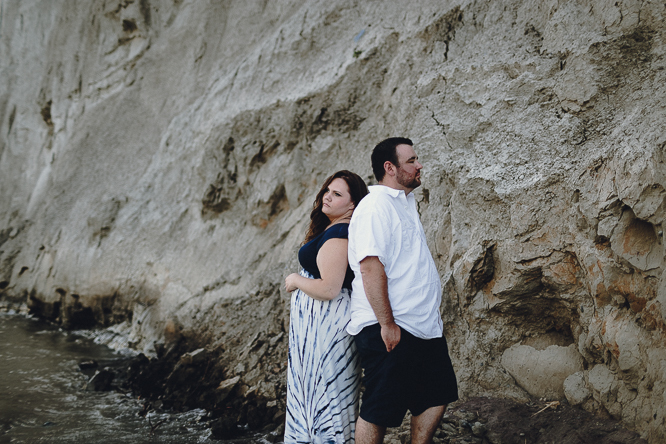 For their engagement session's location, we chose the mighty Scarborough Bluffs. Their wedding's taking place in a barn in Cambridge so an e-session in Toronto's water front was something different. I also felt the bluff signified something strong and unbeatable. I felt that it's a good for for these two resilient minds. Jessica and Al reminded me of a Rocky's quote. "The world ain't all sunshine and rainbows. It is a very mean and nasty place and it will beat you to your knees and keep you there permanently if you let it. You, me, or nobody is gonna hit as hard as life. But it ain't how hard you hit; it's about how hard you can get hit, and keep moving forward". I wasn't sure if I fully comprehend the idea but I still felt like I can smell the difference of people who had been through challenges in life. There's that undeniable toughness in their skin, in their breath, in their eyes. Jessica and Al were soul mates and partners in crime. I can't wait to document their wedding in the summer!